We have uncovered many exoplanets within our galaxy, some as common as the rocks of the asteroid belts and others as rare as Earth, though we have yet to find another Earth. We have found planets made of diamonds, moons covered in ice or methane, and planets with potential oceans that might harbor life within it. There are even some planets as old as the universe itself. At a hefty distance of 1,400 light years away from Earth, the exoplanet, named Wasp-12b, held many secrets from us since we discovered it in 2008. As time progressed, researchers uncovered many of those secrets making Wasp-12b once of the most researched exoplanets that we have. Wasp-12b is considered a “hot Jupiter” because it is a gas giant, with twice the radius of Jupiter, and it is extremely hot due to its orbit. It orbits very close to its sun, which is similar in size to our own sun. This proximity results in a very harsh environment and a tidally locked planet with a day side and a night side. The close proximity also means that the sun exerts a stronger gravitational force on the exoplanet, which results in Wasp-12b having an egg-like shape versus the spherical shape of Earth. The tidal lock has staggering consequences for the exoplanet as the daylight side remains around 4,600 degrees Fahrenheit and the night side drops down to a cool 2,200 degrees Fahrenheit. If we were to visit Wasp-12b, it would appear as red hot, like hot metal, because of the intense heat. The consequence of this disparity leads to many of the features we see on Wasp-12b, including the darkness. Representation of the size comparison between Wasp-12b (right) and Jupiter. Image acquired from Wikipedia/Aldaron. “Exoplanet Comparison WASP-12 b” by Aldaron via Wikipedia is licensed under the Creative Commons Attribution-Share Alike 3.0 Unported license. Recently, astronomers from McGill University in Canada and the University of Exeter in the U.K used Hubble’s Space Telescope Imaging Spectrograph (STIS) to measure the amount of light that is absorbed and reflected by the exoplanet. This was done in October 2016 during an eclipse of Wasp-12b, where the exoplanet would pass behind its sun, in order to provide an increased precision of the STIS instruments. The researchers would use STIS to measure any decrease in the amount starlight that occurs during this moment of the eclipse, which would tell them how reflective, or not, the exoplanet was. They found that there was almost no light being reflected from the exoplanet. Taylor Bell, a master’s student at McGill University and the lead author on the paper, remarked on how the measurements for the light reflection were so low that this was “…making the planet darker than fresh asphalt.” The researchers concluded that the daylight side of the planet must be absorbing all of the sunlight for it to result in near complete darkness. With the conclusion that the daylight side of Wasp-12b was absorbing all the sunlight, the reason for this was fairly straightforward: it was really hot. Other hot Jupiters that are as dark as Wasp-12b are also cooler than Wasp-12b because they are covered in clouds, to keep it cool, and alkali metals that absorb their sunlight. Wasp-12b, on the other hand, is dark because the heat on the daylight side makes it impossible for clouds to form in order to reflect any light. The alkali metals are also ionized by the heat. The extreme temperatures also cause molecules to break apart and perpetuate the heat. As the sunlight hits the daylight side of the exoplanet, it travels deep within its atmosphere and is absorbed by hydrogen molecules (H2), which are then broken into atomic hydrogen, creating a lot more heat energy. The night side of the exoplanet, which is significantly cooler, is drastically different from the daylight side. It is cool enough for clouds to form and water vapors to exist, but all of this is done in darkness. The clouds help to defuse some of the heat, which assists in lowering the temperature. Wasp-12b represents a stark contrast to many of the other hot Jupiters that exist in our galaxy. 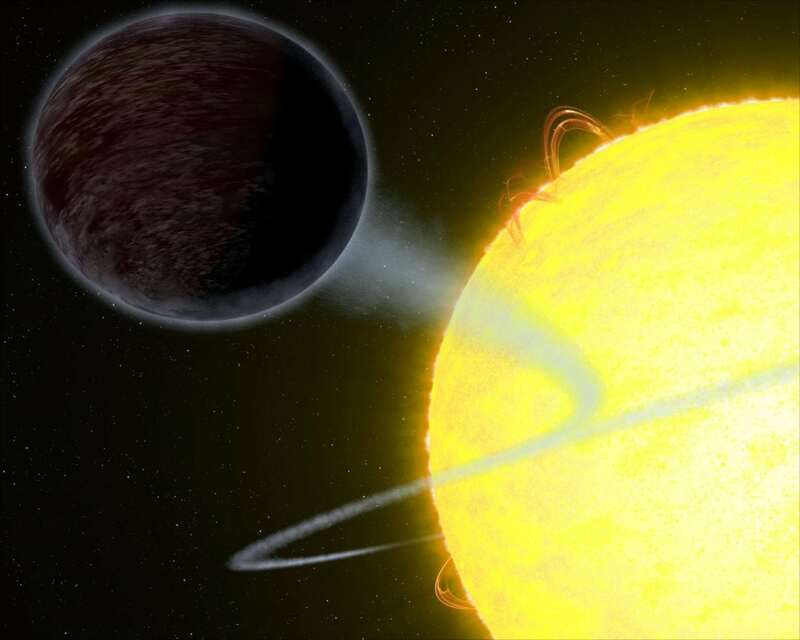 “We did not expect to find such a dark exoplanet,” said Taylor Bell. “Most hot Jupiters reflect about 40 percent of starlight.” It was a surprise to find a gas giant like Wasp-12b, and even more surprising that it was completely different from the other dark hot Jupiter that was also found. The researchers concluded that this contrast from the other dark hot Jupiter represented the importance of using light reflection observations like those from STIS to better understand exoplanets and continue to uncover further mysteries that they contain. They also felt that it showcased the great diversity that exists among exoplanets and among hot Jupiters. There are many more planets, moons, and other celestial objects that we need to look at. Arugia constellation, the home of Wasp-12b, contains a myriad of potential planets that we can look at using technologies like STIS. Wasp-12b is expected to continue on this dual path of extreme heat and relative cool, but previous observations suggest that it may not continue forever in its current form. In earlier experiments, researchers used Hubble’s Cosmic Origins Spectrograph (COS) and found that materials from the exoplanet where escaping into space. This meant that over time the planet would begin to shrink. The consequences of that are dire for Wasp-12b. In some extreme cases, it could lose enough mass and gravitational power of its own and be pulled into the sun. Alternatively, the loss of mass can lead to disruption of its orbit and Wasp-12b might be flung into the darkness of space. These remains speculations and more research would be needed to give a definitive idea of the exoplanets future. NASA scientists estimate that Wasp-12b may only live for another 10 million years based on the current rate of materials leaving the exoplanet. For now, we can continue to study and admire this strange darkness.